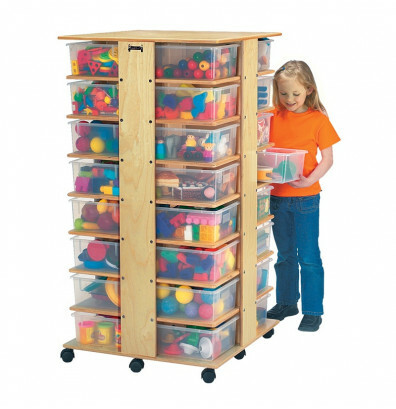 Jonti-Craft 32 tub tower cubbie classroom storage unit offers quality birch wood construction. Clear plastic storage tubs easily organize items. Neatly stores school supplies and activity tools. Overall Dimensions: 27" W x 27" D x 53-1/2" H.
Jonti-Craft tub tower cubbie classroom storage unit with clear tubs is constructed of long-lasting birch wood with an acrylic coating that is durable and resists yellowing. Easy to clean surfaces. The four sectioned tower has eight tub openings in each section; thirty-two clear plastic storage tub trays provide added organization. Ships fully assembled.